World Showcase offers a variety of dining and imbibing options, but one of the lesser known culinary adventures is well worth the investment and time to explore. I am speaking, of course, about the World Showcase Wine Walk. Here are the basics of what you need to know to take part in this affair. You can start at any of the three participating wine cellars, Germany’s Weinkeller, Italy’s Enoteca Castello, or France’s Aux Vins de France, and, for twenty dollars per person, you will receive a passport entitling you to six two-ounce tastings of wine spread out across the three stops. Let’s pause here a take a look at the wines offered, the notes provided on each by the Wine Walk passport, and my own tasting notes. Valckenberg Madonna Spätlese: Due to riper grapes than those from the main harvest, this Spätlese, or late harvest, has expressive fruitiness, very outgoing intensive floral bouquet, delicate sweetness and rather soft acidity. Tasting Notes – There was a sweetness to this wine that reminded me of confectionary sugars and warm caramel. The sweet nature of this wine allows it to stand on its own, or pair well with shellfish, and would definitely attract the palates of those who are squeamish to jump into the world of wine. Vlackenberg Madonna Liebfraumilch: A harmonious ensemble of rich fruitiness, a delicate sweetness, back by a mild acidity and a lush seductive bouquet. Tasting Notes – What this wine lacks in smell, it makes up for in the full flavors available to it. The tartness found in this wine is reminiscent of green apples and pears that have not fully ripened. Castello Banfi San Angelo Pinot Grigio, Tuscany IGT: San Angelo Pinot Grigio is an elegant wine of pale-straw color, with an intense, fruity aroma, followed by a clean, rich, refreshing taste. Tasting Notes – At first sniff, this wine fills the nostrils with the various varietals of apples. The fruity nature of this wine carries over to the taste, but switches from apples to a crisp citrus flavor, with a predominantly grapefruit twist. Rosa Regale, Piedmont DOCG: Rosa Regale is a unique red sparkling wine. Aromatic with a hint of rose petals and raspberries, Rosa Regale is delightfully vivacious and festive. Tasting Notes – This sparkling wine gives an immediate floral whiff, chief among these scents are roses, but also a hint of anis. After a quick taste, most will immediately go back for more, as this wine’s puckerishly sweet flavor will remind many of either black cherry soda pop or bubble gum. Georges Duboeuf Pouill Fuisse, Macon: Bright flavors of pear, red apples and citrus are balanced in this classic French expression of Chardonnay from Burgundy. Tasting Notes – I am generally a fan of Burgundy wines, but this wine had an indistinct bitter smell that carried over to the taste and made it unpalatable, in my opinion. Chateau Tour de Segur – Lussac St. Emilion: From the right bank of the Gironde river originates the vineyard of this structured red Bordeaux. Predominantly blended with Merlot, this full bodied wine displays flavors of black currants, black cherries, and generous oak spices. Tasting Notes – An almost creamy sensation fills the mouth with this well put together wine. Once accustomed to the texture of the wine, a distinct combination of raspberries, currants, and red apples permeate the flavor spectrum. Each palate is different, so while I may have had a distaste or fond affection for a specific wine, I have no doubts that there are those guests out there who will have the exact opposite reactions I did. This is only one of the reasons why I think that the World Showcase Wine Walk is such a pleasurable jaunt to take. It is worth mentioning that you are not required to take both wines at the same time. If a guest would prefer to start in Germany, taking one sample at a time, as they make their way towards France (or vice versa), and then turn around and taste the second offered wine, that is completely acceptable. If there is one change I would desire the Wine Walk to make, it would be to move towards a more uniform glass for tastings. Both Enoteca Castello and Aux Vins de France offered their samples in the larger glasses that could hold a full pour. By placing the samples in these glasses it is much easier to gauge the bouquet of each wine. The Weinkeller, however, used the two-ounce glasses and, while filled to the brim, offered no way in which to sniff the wines and required the slurping of the top layer of liquid before the glasses could be moved to avoid spillage. 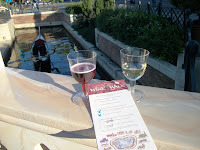 Overall, the World Showcase Wine Walk offers a great slice of the worldly wines available within World Showcase, and the globe in its entirety. 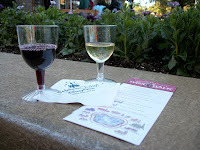 The side effect of such a slow paced activity not only allows guests to smaple great wines and meander at a slower pace through World Showcase’s various pavilions, but it also educates guests on the topics of wine varietals and the manners in which wine can be fully enjoyed and what wines work well within a meal range. I usually stop only at the Aux Vins de France. Thanks for the insights into these others. I knew they were there - just never stopped in. Thanks for the comments on the wines. We enjoy doing tastings, and we usually end up getting our wines from Germany when we're there. Enjoyed your descriptions. It's now on my list of things "to do soon"! Great info - many years ago, when I was very much under the age to drink, my dad took part in something similar to this in Germany. I remember because I accompanied him to help pronounce the wines as I was learning German at the time. I have overlooked this, now that I can drink, but I think I will take some time on my next visit to participate! 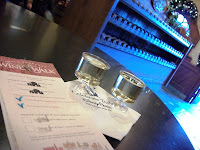 Great breakdown and review of the Wine Walk. I love that spatlese.